Three giant UFOs covered in glowing red lights recently came soaring over the home of Sue Fitzgerald, the Batchelor resident claims. The three bright circles were moving towards a floating white orb, she said. "It was travelling so effortlessly," she said. "The lights have come past from the south." As soon as the glowing objects met, Ms Fitzgerald said all four vanished. "Nothing can disappear that quickly," she said. "Leaving behind this tremendous noise." Ms Fitzgerald said the encounter started about 7pm on a Tuesday in December, when the floating white orb appeared in the distance. "It was flying from the east," Ms Fitzgerald said. "Looks like a fast helicopter, a big white light like a dome - under it, it was sending off red, white and green lights. It looked like something was being teleported." In the next two hours, Ms Fitzgerald said the orb got closer and closer, until it was clearly visible from her driveway. "At five minutes to 9pm, I go out there and it's a lot clearer," she said. It's then when the three egg-like objects could be seen in the sky. "They were bright red - like the fidget spinners these kids have," Ms Fitzgerald said. It's not the first encounter that Ms Fitzgerald has had with the supernatural. "My first encounter with this kind of thing was in 1999," she said. "That was in Parap, and it was a giant floating egg - it took me back to the beginning of time." Communicating with her through the mind, not through the voice, Ms Fitzgerald said the other being told her it was from Mercury. "They couldn't come here yet, because it was too hot and they had to wait," she said. "He was as big as the Rock (Uluru), dressed in polar bear skin, with a big, big nose and white skin - and the bluest eyes." Ms Fitzgerald suspects there is something in the Earth aliens are after. 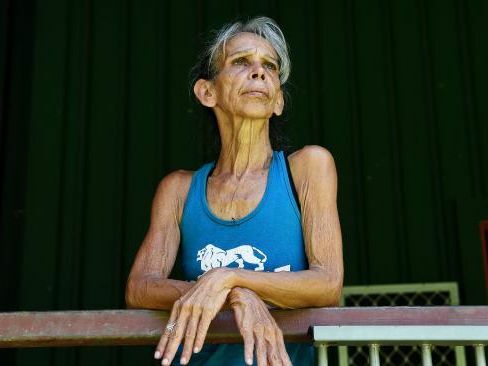 "I'm from the first uranium mine on Earth," she said. "That's what they are coming for, there is something in the water they are looking for - a mineral." "Open your mind," Ms Fitzgerald said. "They're here; they've been here for a long time."